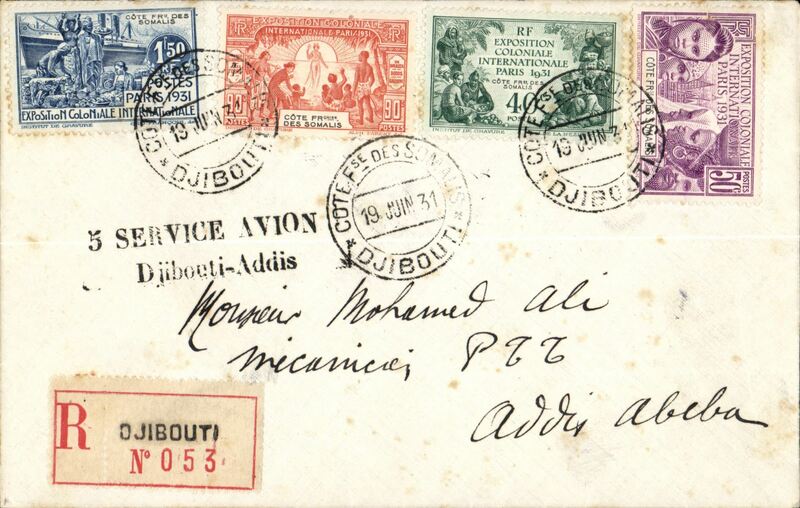 Fifth air service, Djibouti to Addis Abeba, Ethiopia, bs 20/6, registered (label) cover franked 3.30F, nice strike black two line "% Service Avion/Djibouti-Addis, Mu #5. 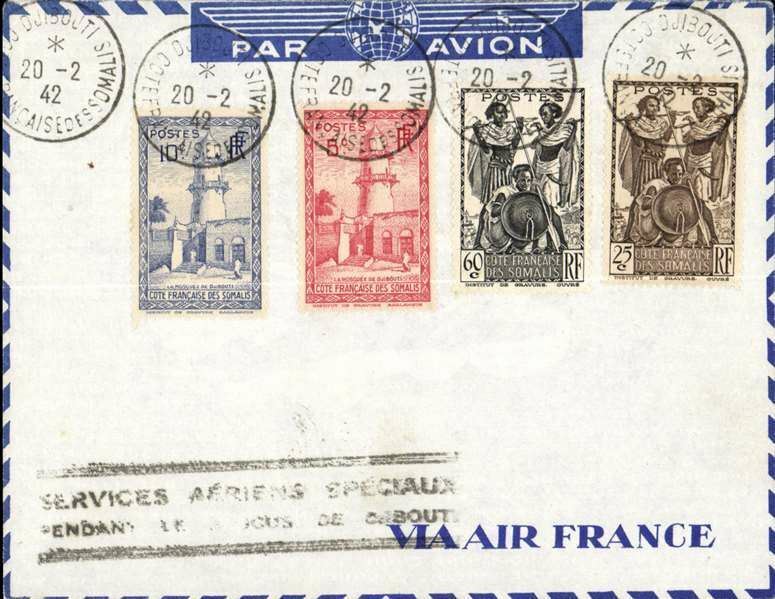 Air France/Ala Littoria,inward to Djibouti, 15 Fev 38 arrival ds from Paris, airmail etiquette cover correctly rated 65c postage and 4F airmail surcharge, written up on exhibition page. Flown by AL to Asmara (Eritrea) then on to Djibouti. An exhibition quality cover written up on display page with nice route, airline carrier and postage rate documentation. 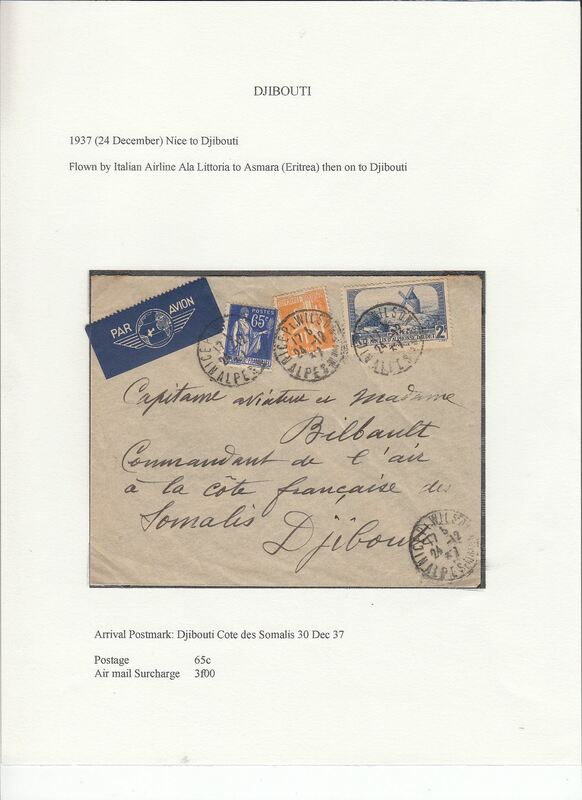 Air France/Ala Littoria,inward to Djibouti, 30 Dec 37 arrival ds from Paris, airmail etiquette cover rated 65c postage and 3F airmail surcharge. Flown by AL to Asmara (Eritrea) then on to Djibouti. An exhibition quality cover written up on display page with nice route, airline carrier and postage rate documentation. 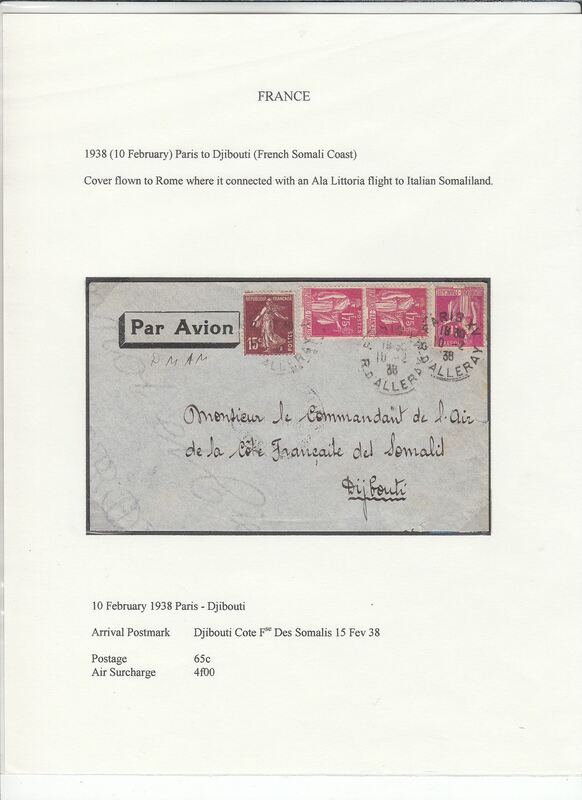 World War II Emergency Blockade Runner mail flight, Djibouti to Marseille, bs Marignane Airport (Marseille), blue/grey'Via Air France' envelope franked 100c, black framed two lline "Services Aeriens Speciaux/Pendant de Reacus de Djubouti".